Prominent & Leading Exporter from Anand, we offer drag chain, bagasse carrier chain, heavy duty chains, flow chain, screen chain and stainless steel chains. We are instrumental in offering a broad gamut of Drag Chain to our valued patrons. Offered range is manufactured using superior quality raw material that is procured from the most credible vendors of the market. Our quality checkers evaluate the entire range for any flaws and defects. 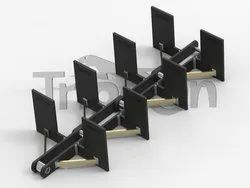 Moreover, customers can avail these in various sizes and grades as per their requirements. Backed by a team of dexterous professionals, we are able to offer Bagasse Carrier Chain, which is made by making use of optimum quality raw material that is sourced from the most credible vendors of the market. Offered range is fabricated as per set industrial norms to ensure their defect-free nature. We offer these in various sizes and specifications as per the choices and requirements of our prestigious clients. Lime Stone Paver Chains for various machines (e.g. Apollo, Unipave, Bitelli, Blaw Knox, Titan, Vogele). 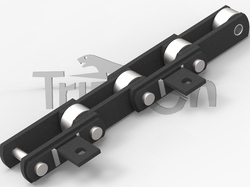 Tripcon is one of the leading manufacturers of heavy Duty chains. Our chains are made from Quality raw materials, also our chain are heat treated in enclosed environment to give a good quality hardened product. Due to appropriate selection of quality materials and achieving necessary properties by doing heat treatment by which chain can resist high abrasion to ensure a better life of the chain. Full round pins and bushings have consistent press fits for the ultimate fatigue strength. We make the perfect holes that insure maximum interference fits. In-house controlled heat treatment processes for balanced hardness to insure good core strength for toughness along with a high case depth for long wear properties. Backed by rich industry experience, we are instrumental in offering a vast variety of Flow Chain. The offered Chains offered by us find wide application in various industries for and sectors. Moreover, our team members fabricates the entire range as per various well-defined parameters to ensure their adherence with international standards and norms. Tripcon we believe that the best service that we can provide to a customer is by making the best quality product. We follow this policy. So, you are guaranteed of a quality product. A chain with blades is operated where the material is powder to cause the powder to flow in the same direction as the feeding direction of the chain. This is called a Continuous Flow Conveyor Chain. The same type of chain is also used in a similar way for discharging the dust generated by various dust collectors. Special alloy steel provides greater tensile strength and this chains simple construction provides greater allowable wear. 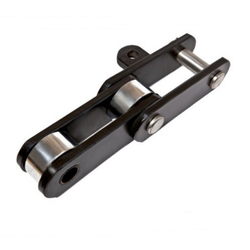 This chain is ideal for conveying material that is abrasive, wet or hot. 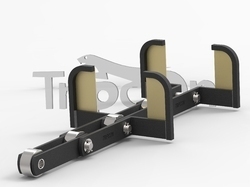 The base chain consists of outer link plates, inner link plates & pins. Attachments can be wielded onto the base chain. The chains are also ideal for preventing environmental pollution because they convey powdered material and grain in sealed case. 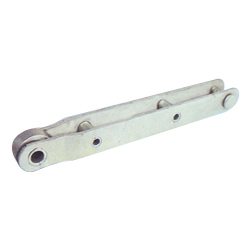 We have emerged in offering our valuable customers a wide array of Screen Chain. Our products are designed and manufactured in adherence with the industry set quality parameters. For its high performance abilities in even under critical conditions, these products all the attachments are linked by bolting through the Hollow Pin. This range is features with attachments which are either bolted up tight or held in the Hollow Bearing Pin in a 'free' manner, depending on the process. 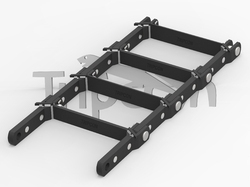 Tripcon has 25 years of experience to make excellent quality Stainless Steel chains. Provided by us is a comprehensive gamut of DBC Chain to our valued patrons. These offered range of Chains is designed and developed in compliance with the international quality standards under the astute supervision of our team of qualified and dexterous experts. We make sure to analyze these products on well-defined quality parameters to ensure flawlessness and error free nature.